Vertex BS-2A 10-1/2" Universal Dividing Head Set (3800-5814) ~ New style increases productivity and saves time as there is no need to change gears. ~ Ideal for easy indexing of divisions from 2 to 50 and most numbers from 52 to 380. ~ Designed for all types of gear cutting. ~ Worm and spindle are hardened and ground. ~ Features spiral machining capability. ~ Allows you to divide in any angle by the direct, indirect or differential methods with the unique dividing head. ~ Ratio between worm and worm gear is 40:1. ~ Features a threaded spindle nose and 24 hole dividing plates with easy conversion to fast, direct indexing on numbers 2, 3, 4, 6, 8, 12, and 24. 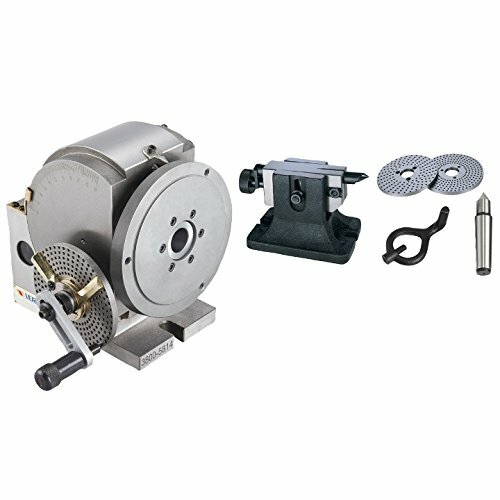 ~ Set includes a tail stock, a set of dividing plates, a set of carrier clamps, a 3-Jaw plate and a center. ~ Optional 4" or 6" 3-jaw front mount chucks for this dividing head set are available. Search for 3800-5820 or 3800-5822. New style increases productivity and saves time as there is no need to change gears. Ideal for easy indexing of divisions from 2 to 50 and most numbers from 52 to 380. Designed for all types of gear cutting. Worm and spindle are hardened and ground.